Dean Russo is a native of Brooklyn, New York, He draws inspiration from urban landscapes and his love for dogs to create truly unique artwork known for its brilliant colors and bold abstract designs of mesmerizing shapes and symbols. To create these one of a kind images he uses a minimum of ten mediums per painting including pastels, ink, oils, pencils, wax, charcoal and spray paint. “I used to paint portraits of rock icons and Hollywood stars for so many years with my dogs by my side. Till one day I thought, why not paint my two favorite subjects,” says Russo. Initially inspired by his two cocker spaniels, Dean began working with rescue centers to donate his work and to raise awareness. Dean strives to communicate a message that encourages people to choose adoption, to acknowledge the world-wide failure of breed specific legislation and to combat dog fighting around the world. “When a child sees, hears and acts upon my message, I feel successful. Anytime someone puts a message of love or respect towards people or animals into the universe it builds like a ripple. I hope I live long enough to see my ripples come back to me. 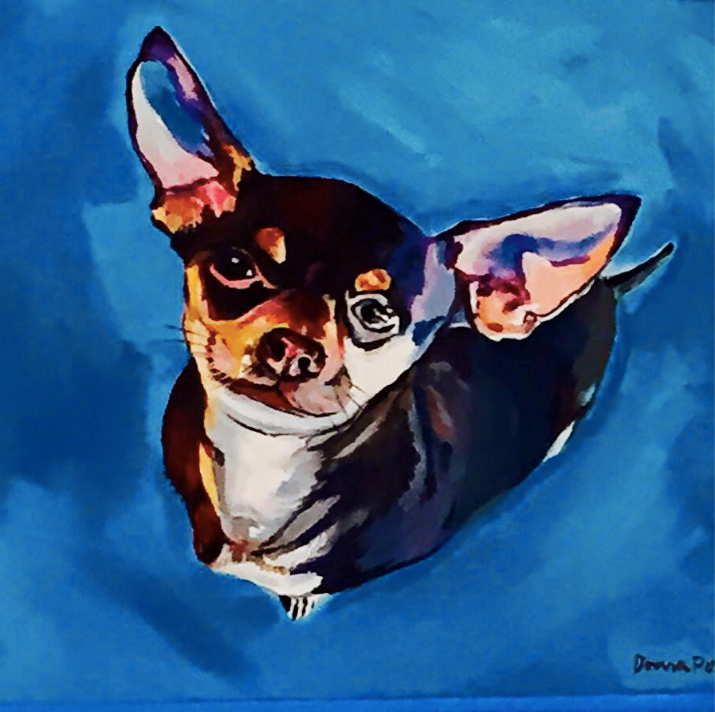 That will make me smile.” Dean Russo has graciously allowed Canine Skin Solutions to feature his artwork on our Facebook page and group. Thank you from Drs. Helton Rhodes and Bonenberger! Donna Porter is an artist who lives and works on the Main Line of Philadelphia. She has a BFA and MFA from the University of Pennsylvania. Donna was a double major in Philosophy in undergraduate studies. She wrote her thesis in Aesthetics contending that "Art is an Activity" for the artist and the viewer! Donna studied in Oxford, England while taking classes at Oxford University's Ruskin School of Art, St. Katherine's, and St. Clare's Hall. She has studied under such renowned artists as Neil Welliver, Rafael Ferrer, John Ross, Hitoshi Nakazato, Robert Engman, Peter Cozzolino, and color theorist, Sy Silman. After a 37-year art career in Japan, Lynn Matsuoka is now sharing her visual wealth throughout the Hamptons. Her peek at life behind the scenes and the insights into ancient Japanese life opened magical doors to a previously hidden world of mystery. And now she turns her all-knowing eye to the culture and intrigues of American equestrian endeavors. Matsuoka's art conjures up the poetic imagery of birds in flight and horses gliding over the earth. They often feature hand-made rice paper, lending a rich substrate of unique depth and tactile quality wherever her brush lands. It adds further credence to her reportage skill and energy, where she quickly converts people, animals and events into inspirationally renewing art. When she finishes a painting or drawing, it not only "looks" but "feels" like the person or animal depicted. It's all part of her open energy approach, a rare artistic gift that creates instant emotional connection. She learned these very fast "reportage drawing" techniques through her time studying with the great Jack Potter at the School of Visual Arts in New York City. She begins her compositions capturing delicate nuances of the world she surveys. Using graphite pencils and oil pastels on canvas or rag paper, she first creates a likeness, then sketches in quick, exacting detail the costumes, colors and energy forces inherent in her subjects. Born in New York City, Lynn studied art & music at Temple University in Philadelphia and later studied at SVA with Jack Potter & Milton Glaser. Canine Skin Solutions thanks these featured artists for their vision and contribution. Respect and compassion for animals is a focal point in all of our endeavors.